alaTest has collected and analyzed 649 reviews of Sanyo Xacti VPC-CG10. The average rating for this product is 4.1/5, compared to an average rating of 4.0/5 for other Camcorders for all reviews. Reviewers are impressed by the design and portability. The image quality and price are also mentioned favorably. There are some mixed views about the battery. Many are negative about the connectivity and viewfinder. We analyzed user and expert ratings, product age and more factors. Compared to other Camcorders the Sanyo Xacti VPC-CG10 is awarded an overall alaScore™ of 87/100 = Very good quality. alaTest has collected and analyzed 104 user reviews of Sanyo Xacti VPC-CG10 from Amazon.co.uk. The average user rating for this product is 4.1/5, compared to an average user rating of 4.0/5 for other Camcorders on Amazon.co.uk. Views about the design and image quality are on the whole positive. The portability and price are also appreciated, but some have doubts about the viewfinder and durability. Comments are divided on the color. alaTest has collected and analyzed 308 user reviews of Sanyo Xacti VPC-CG10 from Amazon.com. The average user rating for this product is 4.1/5, compared to an average user rating of 3.9/5 for other Camcorders on Amazon.com. Comments about the design and portability are overall positive. The image quality and price also get good feedback. The viewfinder and connectivity get negative views, and there are some mixed opinions about the zoom. For a quick point-and-shoot video camera the Sanyo CG10 is a nifty little camera. The styling might not suit and not being able to stand the camera up without a tripod is a pain, but overall the end results are good. The creamy white and black incarnation of the latest high definition Sanyo Xacti VPC-CG10 model remains desirably attractive and portable too at a weight of 188g with rechargeable lithium-ion battery and card inserted. Although the Sanyo Xacti VPC-CG10 digital camera and camcorder hybrid range has long dared to be different with its pistol grip styling and upright shooting, in present company it's almost conventional. If you're a fan of pistol grip camcorders, the Sanyo Xacti VPC-CG10 is one of the best-value HD options on the market. It's compact, stylish and capable of taking some impressive video and photos. Very good 720p HD video for its class; 5x optical zoom; nice LCD; full featured for an inexpensive minicamcorder. Component cable not included; slow AF, still-camera performance; poor photo quality; pistol grip not for everyone. Sanyo's dual-camera Xacti VPC-CG10 has the design and features to easily shoot both HD-quality movies and 10-megapixel photos, but slow performance and mediocre photos keep it from being a solid do-it-all device. Sanyo's entry-level portable camcorder is very portable indeed, but suffers with some design and implementation flaws. The VPC-CG10EXBK delivers a product that's not exceptional value per se, but it's equally not horribly flawed for what Sanyo's asking for it. For those who just want tiny snapshot video in a unit that's very easy to carry around it could be a good buy. Pocket-able HD camcorder sports lots of options but compromises on quality. Conveniently capture life's important moments. 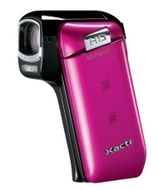 The Sanyo dual camera Xacti CG10 records high definition video, and up to 10-megapixel digital photos with 5x optical zoom. All of these features are contained in a very stylish, sleek, upright design. Videos, still photos and the various settings / menus can be easily accessed with the user's thumb. The CG10 easily fits in your coat pocket and makes sharing videos and photos via social networking web sites, portable video devices like iPods, TVs and computers, easy.